Street parties thumped in Brixton and Edinburgh the night she died. Hundreds gathered. Anarchists, Old Labour, miners, students. People carried signs, saying “Gotcha” and “Rot in Hell”. A riot was planned at Trafalgar Square during the funeral. There was a campaign to get Judy Garland’s song “Ding, Dong, the Witch is Dead” to number one on the UK pop charts (It narrowly missed, placed at number two). I don’t get the joy in celebrating the death of the witch. The air of victory is puzzling. Granted, I did not live with her overbitten monologues on telly as PM every night. Nor did I have a dad turfed out of work by a pit closure or have her wrongly blame supporters of my soccer team for their own death. But the look-at-me-whooping from comrades in England at the passing of their erstwhile nemesis, Margaret Thatcher, sounds tinny to my ear. The gung-ho emails and jigs on Facebook seem ritualistic, a formal clocking in by an expired left, a public signing of one very last petition in sectarian competition for who still manages the most florid hand. I want to say, hey, it’s not like you succeeded in killing her. She died of a stroke, not a strike. Those demonstrating their glee point out that Thatcher left the UK a far less equal place than she found it. She gutted industries. London finance was raised up at the expense of Northern extraction and manufacturing. Greed was encouraged, community broken up. She starved the IRA and branded the ANC. Good Lord, she consorted with P.W. Botha. This is all true but this is the thing: I cannot remember exultation from South Africans when P.W. 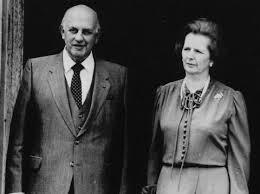 Botha died even approximating the Thatcher spectacle. And it is not like the Iron Lady came close to the Groot Krokodil in unpleasantness to her people. So it is not a greater degree of oppression that explains the greater sense of triumph. It is not a greater culture of decorum in South Africa either that explains why no-one here said they would dance on Botha’s grave or planned a riot for his funeral. Something else must explain why some over the seas are so excited. Could it be that when he died, what P.W. Botha stood for had, at face value, been defeated. Mandela was out, the ANC reigned. Communist neighbours, generals, parliamentarians, CEOs and drinking buddies were everywhere to be seen. Those hurt by Botha here, and hurt he certainly spread around, could emotionally ignore the tyrant’s extinction because what he stood for was buried with him. In the UK, the terms of the political battle were different. And after the battle, the pits stayed closed, London continues to be the finance capital of the world, Liverpool FC’s position on the log is linked to the largesse of futures’ traders in the Fenway Group, and there is not the slightest electoral presence on the left. Thatcher won. P.W. Botha lost. It is not their fault. My comrades fought a good fight. But their witch was not crushed under a house. Instead, the housing market crashed on thousands of munchkins. And when they now croak so loudly that the witch is dead, it’s a sound that comes from those turned into frogs by Thatcher’s sorcery, with no way to be changed back into men. Had Ding Dong reached number one, it would have done so on the back of attaining the highest sales for the week. Those rightly vilifying Thatcher would have had to rely on the market to allocate political value to their views. Even protest is privatized. Thatcher is dead, but Thatcherism is alive and well.